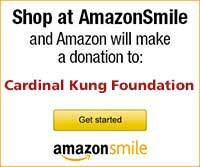 This page is dedicated to providing a space to share your prayer requests through the intercession of Cardinal Kung. Answered prayers that can be documented will serve as testimony in the cause for the Cardinal's beatification. (Please keep this end in mind when you submit your prayer requests.) When we pray together our prayers are fortified. If you want to add your prayer intention to this page, please go to the submission page and ask to have your intention added here. Each day a group of underground seminarians and religious will be praying for these intentions and we invite you to pray for each of the requests posted. Lord, Holy Father, almighty and eternal God, by pouring the grace of Your Blessing into the bodies of the sick, You watch with all-embracing care over Your creatures. Be present in Your kindness as we call upon Your Holy Name. 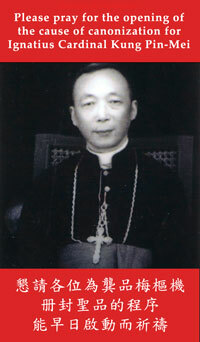 By the intercession of Your faithful servant, Ignatius Pin-Mei, who bore witness to You and to Your Vicar on earth, the successor of Blessed Peter the Apostle, during long years of patient suffering at the hands of the communist Chinese government, we ask that You would free Your servant (name) from all sickness, restore (name) to full health by Your right hand, strengthen (name) by Your power, protect (name) by Your might, and give (name) back to Your Holy Church, with all that is needed for his/her welfare, through Christ our Lord. Amen. Prayer Request For World Peace Now - I pray for world peace to be fully realized now, and for this peace to last forever after, and I ask for all of this in the Holy Name of Jesus. Amen. Please pray for the job search effort of Terese. Please pray that my mother for permanently and miraculously healing from bipolar and restore her peace and happiness. Praise be to God. Please pray for my son Casey Nichols he needs a job so bad he has many bills to pay and is falling behind Please pray that god will grant him a miracle thanks you and god bless you for all your prayers sincerely Rosemaria. For Mary's intentions. To be a Saint. Pray that God will bless his job search effort according to His holy will. Pray for the church in China all who suffer for you. We thank the Lord for their witnesses. Please pray with me and for holiness in the world. Please also for true peace and joy in hearts of minds of all your creatures that everyone will love Jesus, His holy name more and more.